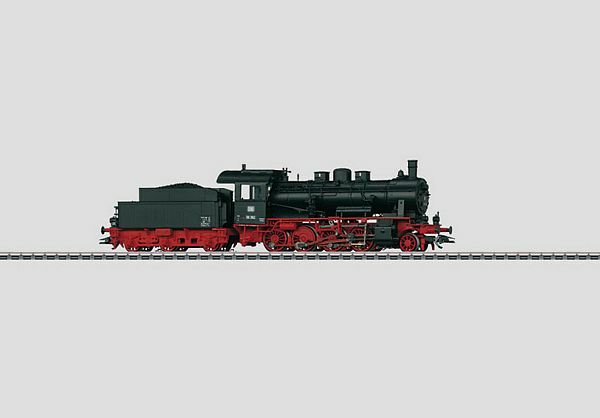 Prototype: Goods train steam locomotive series 56.2-8 of the Deutsche Bundesbahn (DB). Reconstructed Prussian G 8.1 with axle. With DB reflex glass lamps above and Reichsbahn lanterns below. Coal Schepptender of class 3T 16,5. operating numbers 56 362. operating status to 1959. Model: Mfx digital decoder and extensive sound functions. Controlled high-performance drive with flywheel. 4 Axles powered. Traction tires. Locomotive and tender largely made of metal. Fitted with smoke set. Directional alternating three light peak signal and smoke set conventionally in operation, digital switchable. Lighting with warm white light-emitting diodes (LED). Fixed short coupler with kinematics between locomotive and tender. Rear of the tender and at the front of the locomotive quick coupling with NEM shaft. Many separately applied details such as pipes and sand down pipes. Enclosed piston rod protection tubes, brake lines, screw coupling imitation, engine driver and Stoker. 21.1 Cm length over buffers. Lighting with warm white light-emitting diodes (LED).